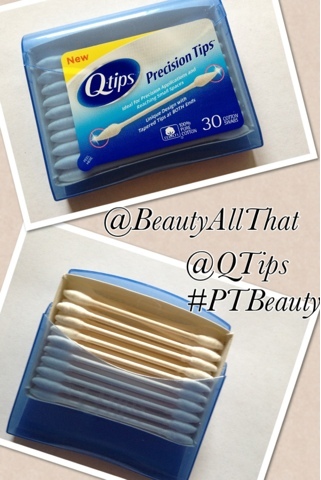 * For Eyes: Use Q-tips for clean-ups of eye-liner or mascara or to help smudge eyeliner. It's precise tips can also be used to help apply liner/smudge dark eyeshadow if you're looking for a smoky effect. Go all out with Glitter by applying glittery eye makeup with Precision Tips. * For Lips: Use Q-tips to apply lip liner OR to help create that cupid bow-shape lip by gently wiping the Precision Tip downwards. Want pout? Apply a dab of your favorite gloss in the middle of your lower lip. * For Nails: DIY Manicures? Soak Q-tips with nail polish remove to help remove extra polish on your cuticles. Be a Pattern-maker by using Q-tips to create dots or other designs on your nails.